of projects, from various time periods, to extravagant fairy tale fantasy frocks to post-apocalyptic warrior wear. If you follow costume design at all, you would probably think that the award should just be called the Sandy Powell. If you think of any sumptuous time period movie, it was likely costumed by the legendary Brit. She has been nominated 12 times, twice for this year alone. She previously won for Shakespeare in Love, The Aviator and Young Victoria. For the forbidden love story of Carol, the designer referenced fashion magazines of the 1940s and 1950s along with photographs of female journalists of the time. 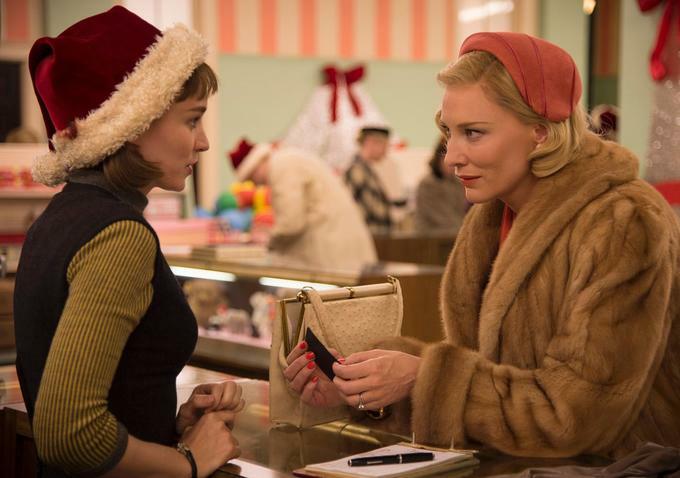 Rooney Mara had a more practical wardrobe while Cate Blanchett's looks were more sophisticated and luxurious. Sandy Powell's second Oscar-nominated film this year was Cinderella. This was an all-out fantasy film for fashion. While there were no specific historical time periods to adhere to, the challenge was reimagining an iconic dress that many people hold dear in their heads. I loved the extreme Dior Haute Couture silhouettes on Cate Blanchett as a personal fashion fantasy. 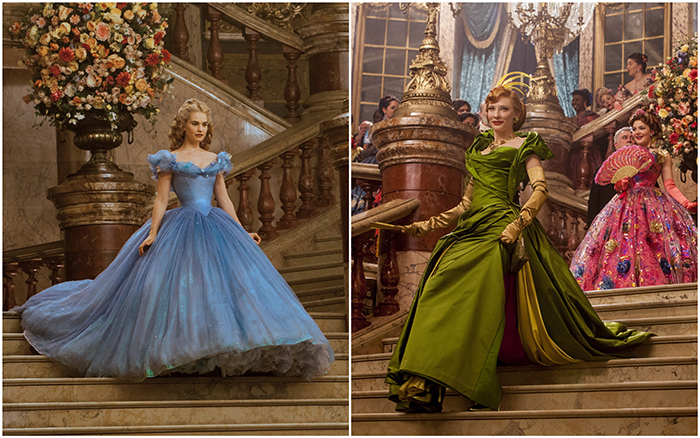 Cinderella's ballgown used over 270 yards of fabric and 10 000 Swarovski crystals. 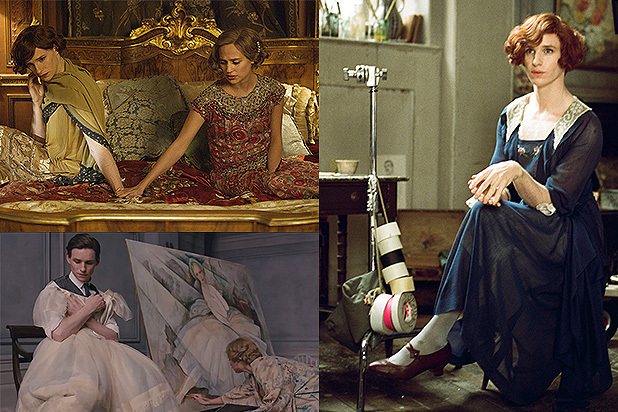 Costume designer Paco Delgado had many challenges in dressing Eddie Redmayne for his transition to transgender pioneer Lili Elbe in The Danish Girl. This wasn't a drag situation. Delgado had to make Redmayne a believable woman in the 1920s but still make the costumes beautiful. Eddie Redmayne has an Adam's apple. Unlike other time periods where you can make a body look more feminine with a tiny waist and full skirt, the 1920's silhouettes were more of a tube. Just putting him in vintage dresses was not going to work, so Delgado had to work with strategic corseting and custom tailored dresses specifically tailored to flatter his body. Mad Max Fury Road is the favorite to win in many categories for this weekend's Academy Awards. Compared to the previous three films, the post-apocalyptic looks of this movie seem deceptively simple. Good costume design is how much it forms or helps create the character itself. Sometimes it blends seamlessly into the film without being a showpiece in itself. Costume designer Jenny Beavan repurposed some of the pieces of the original movie for this reboot. The "wives" look was that of virginal, untouched, but also bandaged, evoking their wounds psychologically and physically. 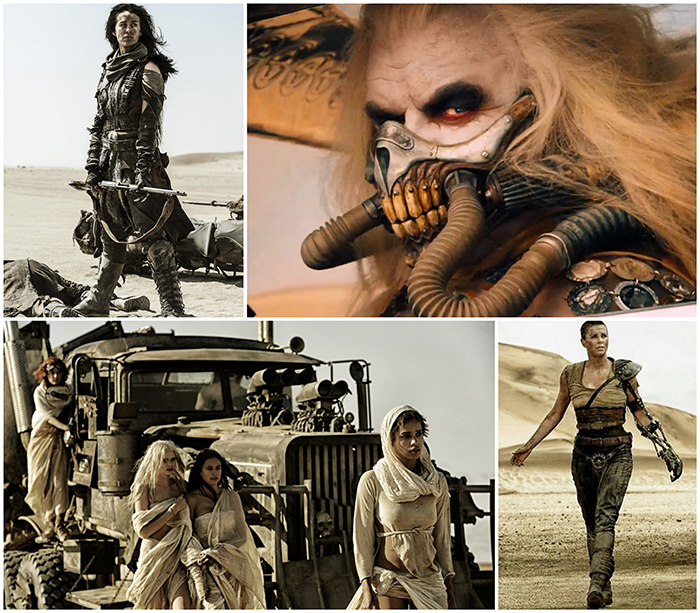 Charlize Theron and other characters had distressed, warrior-like armor that indicated their battle-ready dessert life. Immortan Joe's mask was intimidating, with horse skull teeth (conceptualized by Paul Jeacock) indicating his savage nature, but also his dependence on the breathing apparatus. The Revenant is another movie that is more about dressing to make the character rather than creating a set piece. Costume designer Jacqueline West was used to dressing more glamorous films like Henry & June and The Curious Case of Benjamin Button. 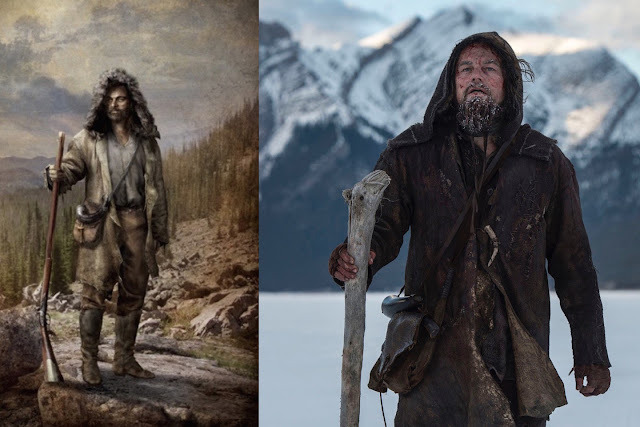 The task of the Revenant was to portray characters that had to use clothing to survive, constructed from pieces found in nature. Leonardo Di Caprio's character is attacked by a bear but later has to use it to survive the (real) cold. The costumes had to be real and protect the actors. West sourced the animal skins from First Nations traders in Canada. Along with her Karen Durrant, she initially attempted to treat them traditionally with grease and animal fat to age them but found that impractical to the film shoot so they developed a wax method with a similar look. We have all heard of method acting. How have we not heard of the term "method designing"? Who do YOU think should win the 2016 Academy Award for Costume Design? UPDATE: Congratulations to Jenny Beavan for winning the Academy Award for Costume Design!